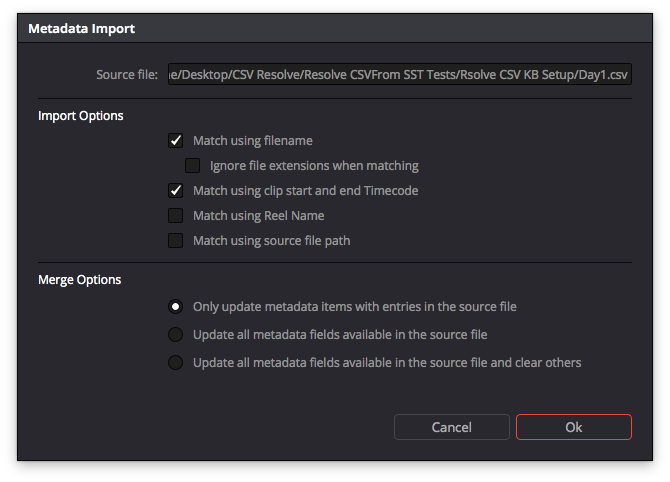 Silverstack offers a solution to export clips to DaVinci Resolve including clip metadata as well as ASC-CDL color metadata. Additionally it is possible to set up Resolve with the according LUTs to reflect the exact node based color processing done in Silverstack. To export to Resolve select the desired bin from the Silverstack Library. 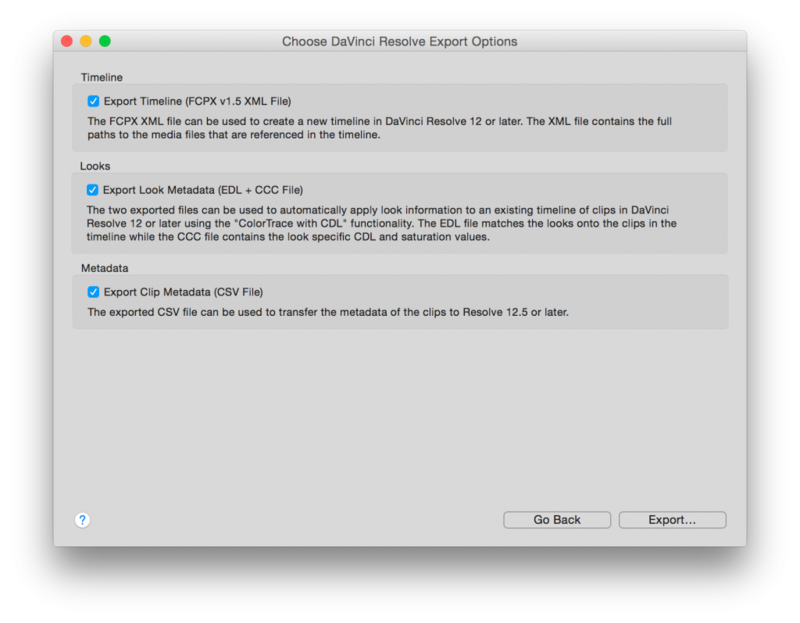 Either perform a secondary (right) click on the bin and select “Export to > Davinci Resolve Export” or from the “Export” button in the title bar of Silverstack choose “DaVinci Resolve Export”. After making your selection click “Continue”. 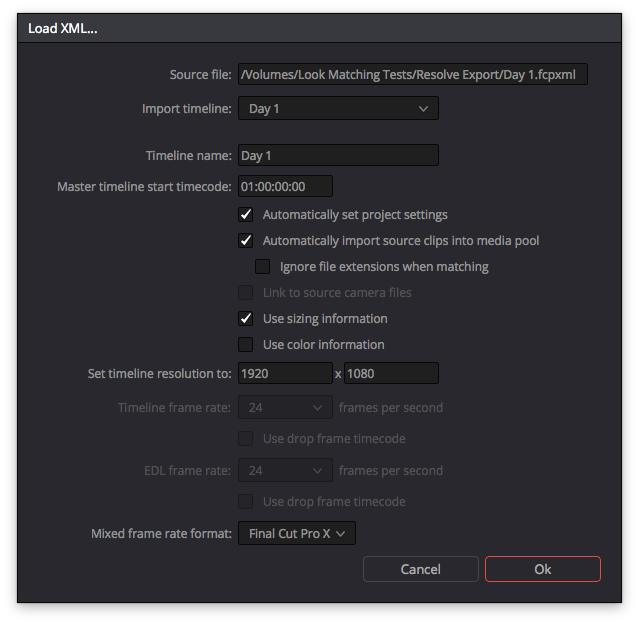 Timeline (.fcpxml): This export item is responsible for creating the timeline and populating the clips in Resolve. 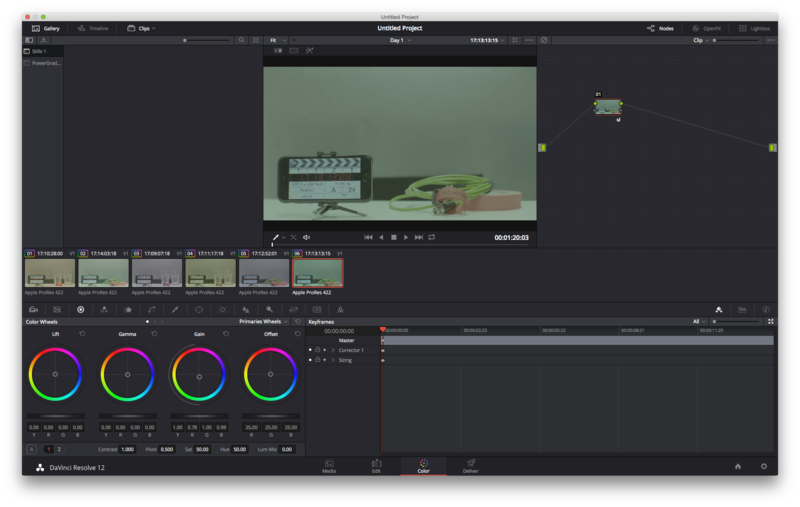 Color metadata/Looks (.edl and .ccc): These export items are responsible for adding the color metadata (ASC-CDL settings) to the clips in Resolve (via Colortrace functionality). 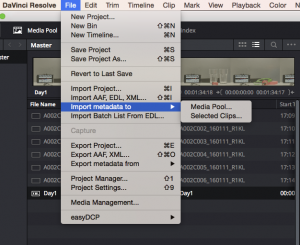 Clip metadata (.csv): This export item is responsible for adding the clip metadata to the clips in Resolve. 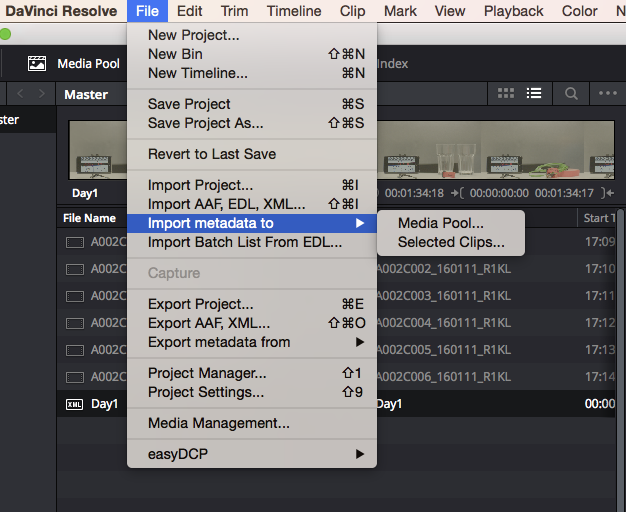 To result with a timeline, clip and color metadata activate all three checkboxes and click “Export…”. Select the desired destination for the files. The FCPXML, EDL, CCC and CSV file will be put in the same directory automatically. 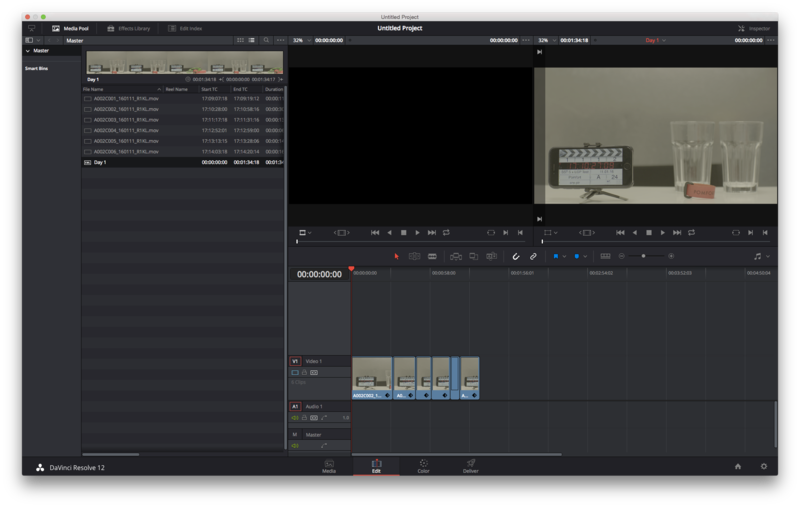 Open up DaVinci Resolve and create a new project. From the Main Menu choose “File > Import AAF, EDL, XML”. Navigate to the path where you saved the FCPXML from Silverstack select it and click open. Check to have the checkbox “Automatically set project settings” enabled which should be the case by default. That makes sure all settings will be adapted to match the clips from the FCPXML. 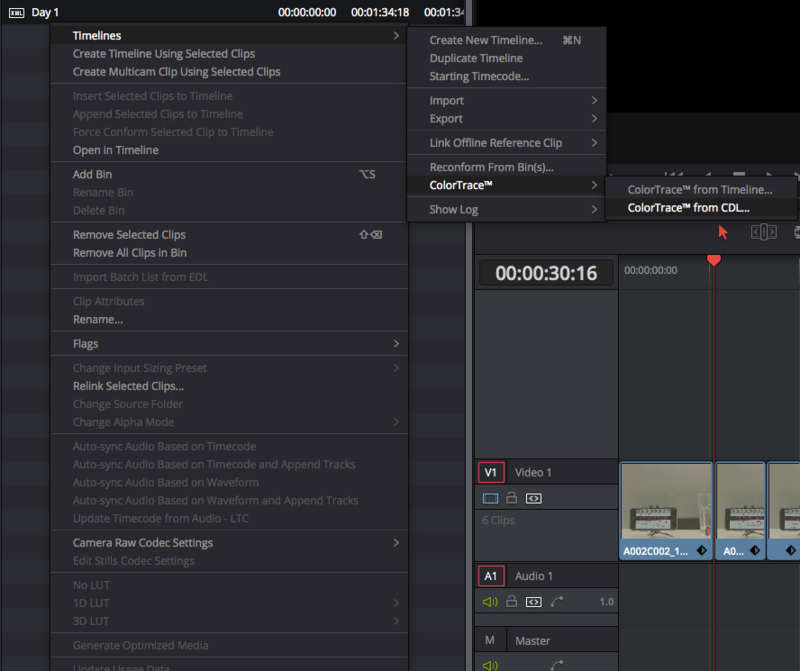 You should be presented with the “Edit” tab in Resolve that shows the Media Pool on the left and a timeline containing all the clips from the Silverstack bin you formerly exported. This process will only work in Resolve 12.5 or later. In the following opening dialog choose the .csv file that you exported from Silverstack and click open. Choose a meaningful combination of Import Options and Merge Options for your use case. Hit “Ok”. All matching clips in the bin should now have received the new metadata. Select a clip and check the metadata section on the right side of the Resolve window for the results. The labels in the brackets reflect the naming of the Resolve metadata fields the Silverstack metadata is mapped to. 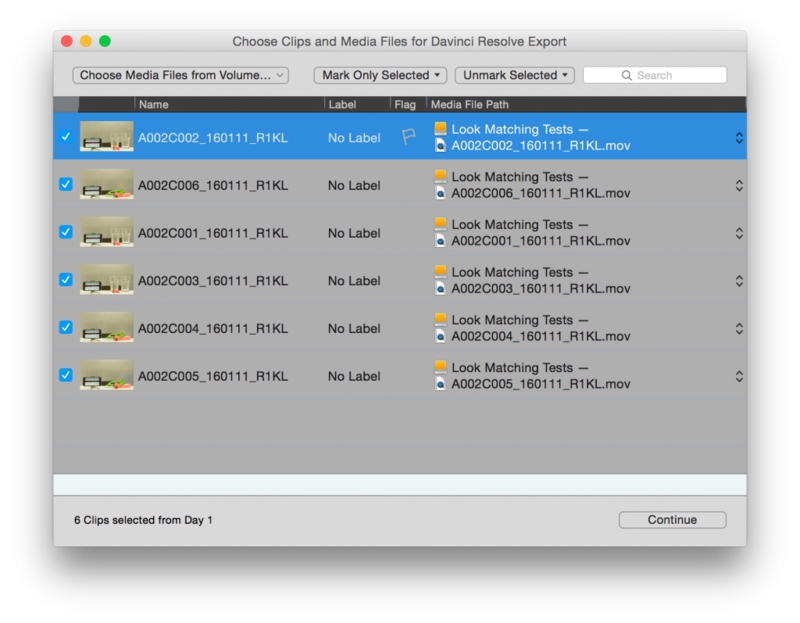 To attain a proper match of the CDL values per clip you have to make sure that the Reel Names of the clips and the Reel Names in the Silverstack EDL match. Based on your clip types as well as path structure and clip file names the settings that match your workflow could differ. 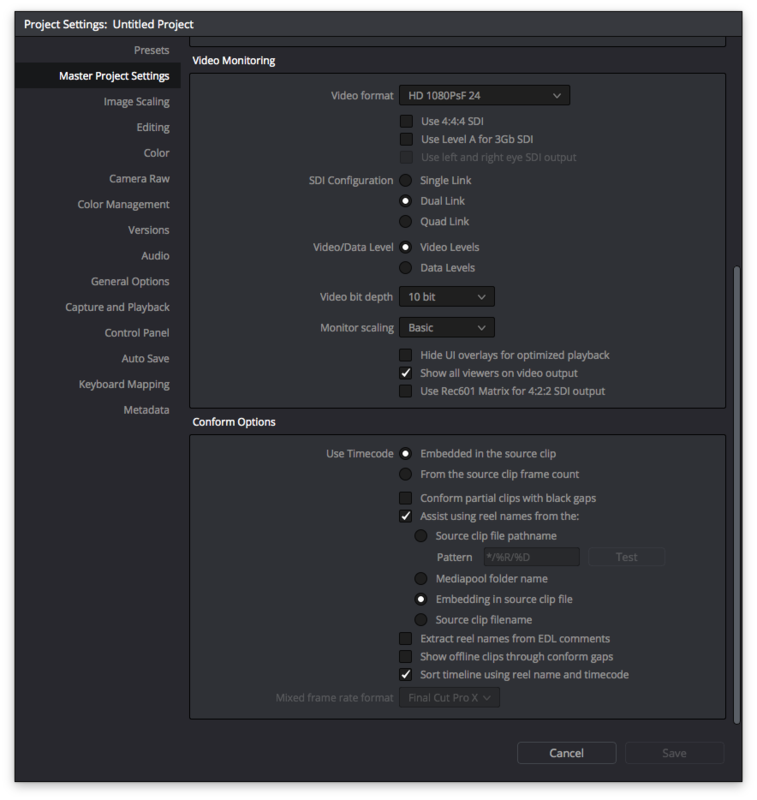 Selecting “Embedding in Source clip file” as an option should work for QT ProRes and ARRIRAW workflows. Search the DaVinci Resolve manual for “extraction pattern operators” to learn how to use extraction patterns to pull reel names from your media paths. Please be aware that the ColorTrace matching wizard will also give you the opportunity to “Ignore Reel Names” (see also Fig. 9) . Use the Colortrace Function to add ASC-CDL color metadata. After creating the timeline you will be able to add the color information. You will be presented with an open dialog where you will first have to choose the exported EDL file. Right after that you will have to choose the exported CCC file. If all the clips have green borders everything matches fine. Click “Copy Grade and Exit” to copy the according grades to the clips.